A finely-decked knight faces us on a grey horse. He carries a gilt banner, and a black bird sits on his shoulder. 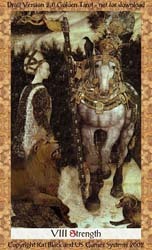 A woman stands with a lion at her side, and a ram lies on the ground.